Adaptive behavior is behavior that raises an animal's fitness in its biotic and abiotic environment. The study of adaptive behavior is mainly the study of how behavior changes with environmental changes. Fitness is the relative contribution of an organism to genes in future generations. Because understanding fitness across the entire life of an organism is a daunting task (and tracking it across several generations even more so), researchers have commonly assumed a particular relationship between behavior in the short term and fitness. This has involved examining many behaviors using many fitness proxies and modeling techniques. This entry explores the simplifying assumptions about the relationship between behavior and fitness while concentrating on a single type of behavior, watching for predators. Though the focus here is on such vigilance behavior, the approach employed may be applied to many other types of behavior. Anti-predator vigilance involves pauses in other behavior, such as feeding, in order to scan the environment for predators. Researchers commonly assume that that foraging animals lift their heads independently of one another and share information about detected attacks. Shared information about attacks is known as collective detection. The original model of anti-predator vigilance showed that in bigger groups each individual could scan less while maintaining the same probability of an undetected attack. If each individual is vigilant v proportion of the time, then an attack goes undetected when no individual is vigilant, which occurs a fraction (1-v)n, of the time where n is the number of individuals in the group. This model did not relate this directly to fitness but determined that animals could scan less in larger groups at the same risk of an undetected attack. Subsequent studies have built upon the assumptions of independent scanning and collective detection of attacks but added dilution of risk. Here the predator can only effectively attack one individual (or perhaps a small portion of the group), even when all individuals are unaware of the impending attack. Other researchers have supposed that animals maximize survival while maintaining a required level of food intake. This second criterion can make sense if food increases do not impact future reproduction very much, for example during the non-growing season for animals that have small growth during this period. These two criteria for adaptive behavior-maximizing food intake while maintaining a set probability of surviving and minimizing risk of attack while maintaining a set level of food intake-obviously cannot both hold true simultaneously. They can, however, both be approximations of a larger truth. In general, fitness will depend on the value of food and the probability of surviving. In simple models, vigilance increases survival but decreases food intake, and thereby future reproductive output. This entry discusses models of the optimal level of vigilance that build upon the work of Parker and Hammerstein but differ from their models by allowing multiple attacks and assuming future reproduction is a linearly increasing function of foraging intake. To develop heuristic models of vigilance in groups, assume that foragers feed for some extended time, T, before reproducing. Animals can forage at any rate between 0 and 1, and there is a direct trade-off with vigilance-food intake is proportional to 1-v. An animal's total foraging intake across the period is thus proportional to (1-v)T and reproductive success at the end of the period is proportional to foraging intake-V = k(1-v)T. In order to reproduce, however, animals must survive this period. If they are attacked at rate ? according to a Poisson process, then the probability of survival decreases exponentially with the attack rate, period length, and the mortality per attack-S = Exp[-Œ±TM]. The probability of dying in an attack increases with foraging rate. For a single individual the mortality rate is M = (1-v). In a group, the mortality rate may depend on the actions of others. This is the topic of the next section. These expressions differ only in the numerator of the ratio in the second right hand term. Since this second right hand term equals the feeding rate, under the ESS, individuals feed at n1/n times the cooperative rate. These results replicate findings that ESS levels of vigilance are lower than cooperative when collective detection is perfect. Analyzing n1/n as n varies shows thatthe difference between the ESS and cooperative solutions is greatest for n=3 and declines with larger group sizes. This expression is negative or undefined when the expected number of attacks is less than the group size, Œ±T n. In this situation, zero vigilance is the best solution. In this null model, a group size effect is present, but generally weak (Fig. 1). Since a strong effect of group size on vigilance has been observed many times in nature, this result suggests that the observed group size effect on vigilance probably depends upon collective detection to some extent. The cooperative solution for the null model is difficult to state in general but for a pair of animals. When fewer than four attacks occur on average (Œ±T4) this expression is undefined and zero vigilance (v*=0) is the best available vigilance level. Compared to the ESS solution for a pair (Fig. 2), without collective detection the cooperative vigilance level is lower than the ESS vigilance level. The models in this entry differ from those of Parker and Hammerstein first in allowing for multiple attacks rather than a single attack. Their equivalent model produced an ESS of zero vigilance for all group sizes greater than 1. In the models described here which include perfect collective detection, the ESS level of vigilance falls to zero when the number of expected attacks is no bigger than the group size. Thus the two models produce similar results under the correct simplifying assumptions, but quite different results are possible when multiple attacks are considered. While earlier models suggested ESS vigilance should be zero for pairs or larger groups, observations showed non-zero levels of vigilance in groups. This mismatch led to consideration of cooperative models of vigilance. The conclusions of these early models apply only in some cases. With perfect collective detection, cooperative vigilance is generally higher than the ESS level. Without collective detection, however, cooperative vigilance is generally lower. In the model with no collective detection, the cooperative response is zero vigilance while the ESS solution is moderate levels of vigilance when between 2 and 4 attacks are expected (Fig. 2) and the ESS level of vigilance is generally higher than the cooperative level anytime two or more attacks are expected. The focal animal is in danger when it fails to detect an attack (1-v). If the other animal fails to detect the attack (1-), the two are equally likely to be targeted by the predator. If the other animal detects the attack (with probability ), the focal animal escapes if it gets information but is the sole target for attack if it fails to get information (1-i) from the other individual where i is the probability that the focal animal receives a warning from the other animal. Study of vigilance generally includes the separate advantages for collective detection and risk dilution, where risk dilution occurs when the predator chooses among of a group of uninformed prey. This distinction blurs, however, when collective detection is imperfect and takes time. If different members of the group have different amounts of information during the course of the attack, dilution depends strongly on when and how predators target prey for attack. If predators target prey early in an attack, risk is spread equally among the n group members. If predators wait until later in the attack, however, they can choose among the subset of the group that has not yet detected them. Thus dilution depends on how many other individuals are similarly uninformed of the attack. The formulation given here assumes that the predator chooses a target after primary detection, but before secondary detection is complete. Thus the predator ignores any individual with their head up at the time of the attack, and chooses with equal probability among the other individuals. This gives an advantage to individuals who are vigilant at the start of the attack. Other formulations would be appropriate if predators could target individuals that were the very last to become informed. Such formulations would place even greater advantage on personal detection of attacks. while the cooperative level is . For small numbers of attacks, these expressions may be negative-so that the internal optimum is zero vigilance. With more attacks, vigilance tends to increase under either the ESS or the cooperative criterion. The effects of information flow are more complicated. With increasing information passing from detector to non-detector, the ESS level of vigilance generally decreases. Cooperative vigilance, however, increases with greater information flow at moderately low attack rates but then decreases at higher attack rates. In all cases, cooperative vigilance is higher than non-cooperative only with i1/2 (Fig. 3). Other work has shown that i1/2 is also the criterion for coordinated vigilance to be advantageous. As pointed out by Steve Lima, the widespread observation that vigilance is not coordinated is evidence against cooperation. The potential fruit of cooperation, the public goods in this case, depend critically on the information that non-detectors get from detectors of attacks. In nature this information may be incomplete or unreliable, so each individual needs to gather information for itself. Individual vigilance is both more valuable and more costly than relying on social information. Thus with multiple attacks and imperfect collective detection, the norm is for each individual to invest in vigilance. The ESS level of vigilance decreases with greater information passing from detector to non-detector. This is seen by examining the best response to the vigilance of the other group member (Fig. 4). With little or no information, the best reaction approaches the level for a single bird (7/8). When information only has a probability one-half of reaching a non-detector, the reaction does not depend on the vigilance of the other group member. Here any increase in detection with the vigilance of the other animal is exactly offset by decrease in dilution when information fails to get through. With i1/2 the best response is considerably lower than for a lone animal, and lower when the other animal is more vigilant. Observations show that animals are often much less vigilant in pairs than alone, suggesting considerable information flow and collective detection. On the other hand, there is much less information that animals react directly to the vigilance rates of others. Perhaps the danger to one member of a group is little influenced by the vigilance rates of others, either because information flow is moderate (i‚âà1/2) or due to some other factor not included in this model. Classic models of vigilance behavior generally considered perfect collective detection and a very limited number of attacks. Some outcomes of the models differ with imperfect collective detection and multiple attacks. Multiple attacks might occur over a substantial period of time, and conditions might change during this period. Consider the situation when group size changes over time. For simplicity, assume that the focal animal spends some portion of its time, p, alone and the rest of the time, q, paired with some other animal. Other assumptions are the same as above. If individuals face various situations with different levels of risk, they may allocate vigilance and feeding behavior across the situations with v1 being the vigilance in situation 1 and v2 the vigilance in situation 2. In contrast to previous models of risk allocation, the models presented here use a linear relationship between feeding rate and detection behavior. This assumption simplifies the models, and also leads to the solution of zero vigilance in the safer situation. The results are striking in that the safer situation in a pair switches at i=1/2. This model of risk allocation does not yield a simple ratio of feeding rates because one feeding rate is always the maximum, 1. The model, nonetheless, illustrates that vigilance depends upon the schedule of other situations an animal faces. With i1/2, the ESS level of vigilance is zero when alone and 1-(1/Œ±Tp) when in a pair. Thus allocation has reversed the modest group size effect seen above with little collective detection. With moderate to high collective detection (i1/2), the vigilance in the pair goes to zero with the vigilance of an animal feeding alone depending on how often it is in a pair. The result is remarkable and counterintuitive in that collective detection leads to an evolutionary stable solution where neither individual is vigilant, detection does not occur, and so collective detection never happens. Thus in any attack on a pair, one individual or the other will die. Because this model assumes that the proportion of time in a pair is not affect by vigilance levels, it implicitly assumes that group members that die are replaced before the next attack. The next section explores whether this combination of assumptions leads to the surprising results. Most models of vigilance have assumed a stable group size. Models of risk allocation assume changes in risk factors, such as group size, but that the schedule of risk factor changes is not influenced by their feeding or vigilance rates. Now consider a model where group size changes as a result of mortality. Assume all individuals start in pairs and that collective detection is perfect (i = 1). The previous results for risk allocation provide an interesting foundation in that they do not predict vigilance in pairs. Therefore vigilance in pairs is due to protecting an irreplaceable partner-which is one kind of mutual dependence in fitness. The assumptions for what happens when a predator attacks a pair are exactly as before. If the other animal dies in an attack, however, our focal animal faces all future attacks alone. The solution involves two vigilance rates, one in a pair and one alone. Survival is summed across all routes in which the focal individual survives, each weighted by its probability. To find foraging success, note that if when the other animal dies in the ith of j attacks, the focal animal forages in a pair for on average i/(j+1) of the total time period and alone the rest of the period. The most important result of this model is that the ESS result is to be vigilant in a pair. With simple risk allocation, the ESS solution is zero vigilance. Thus each individual invests in the survival of its irreplaceable partner because having a partner increases its own survival. Potentially this is a widespread phenomenon for animals in the non-breeding season because animals lost to predation cannot be replaced until the next breeding season. It will only have a large effect, however, when loss of another individual strongly affects the fitness of a focal individual. This could happen if animals spend the non-breeding season in small, closed groups. Given that non-breeding groups are often fluid, mutual dependence might apply more widely to mated pairs that stay together year round. If mates are difficult to replace or mating increases with experience, then each member of the pair would do well to ensure that its partner survives. Thus individuals might often be "mate guarding" but in the broad sense of protecting their partner's survival and ability to reproduce. Perhaps mutual dependence might contribute to the year round territorial behavior of tropical birds. In this entry the initial models of vigilance were very simple yet considered multiple attacks. This exercise was very successful because it was able to recreate results from previous models while showing that these results are not general to multiple attacks. Extending these models to partial information worked well, though general and tractable models were only found for pairs of individuals and not for larger groups. For risk allocation and mutual dependence, the rationale for the first models is limited. The models for risk allocation developed here provide a baseline for analyzing mutual dependence. Here again, the models of mutual dependence were neither as simple nor as general as the models of vigilance they build upon and other models might more readily demonstrate mutual dependence. Thus simplifying assumptions for one purpose may complicate extending the model to another purpose. To explain the logic of potential contributing factors, it can be very helpful to examine a series of very simple models, each resting on its own foundations. When examining the relative importance of and interactions between contributing factors, more complicated models may be necessary. Simple and complex models inform each other, and a range of tools can be useful on any modeling job. Bednekoff, P.A. 2001. Coordination of safe, selfish sentinels based on mutual benefits. Annales Zoologici Fennici 38: 5-14. Bednekoff, P. A. 2007. "Foraging in the face of danger." Pp. 305-329 in Foraging. eds. D.W. Stephens, J.S. Brown, R.C. Ydenberg. Chicago: University of Chicago Press. Bednekoff, P.A. and Lima, S.L. 1998. Randomness, chaos, and confusion in the study of anti-predator vigilance. Trend Ecol. Evol. 13: 284-287. Bednekoff, P.A. and Lima, S.L. 1998 Re-examining safety in numbers: interactions between risk dilution and collective detection depend upon predator targetting behavior. Proceedings of the Royal Society B. 265: 2021-2026. Bednekoff, P. A., and S. L. Lima. 2004. Risk allocation and competition in foraging groups: reversed effects of competition if group size varies under risk of predation. Proceedings of the Royal Society of London Series B: Biological Sciences 271: 1491-1496. Lima, S.L. 1990. "The influence of models on the interpretation of vigilance." Pp. 246-267 in Interpretation and explanation in the study of animal behavior: Vol. 2. Explanation, evolution and adaptation. eds. M. Bekoff and D. Jamieson. Boulder, CO: Westview Press. Lima, S. L., and P. A. Bednekoff. 1999. Temporal variation in danger drives antipredator behavior: the predation risk allocation hypothesis. American Naturalist 153: 649-659. Parker, G.A. Hammerstein, P. 1985. Game theory and animal behaviour. In: Evolution: Essays in Honour of John Maynard Smith (Ed. by P.J. Greenwood P.H. Harvey), pp. 73-94. Cambridge: Cambridge University Press. Pulliam, H.R. 1973. On the advantages of flocking. J. Theor. Biol. 38: 419-422. Treisman, M. 1975. Predation and the evolution of gregariousness. I. Models for concealment and evasion. Anim. Behav. 23: 779-800. 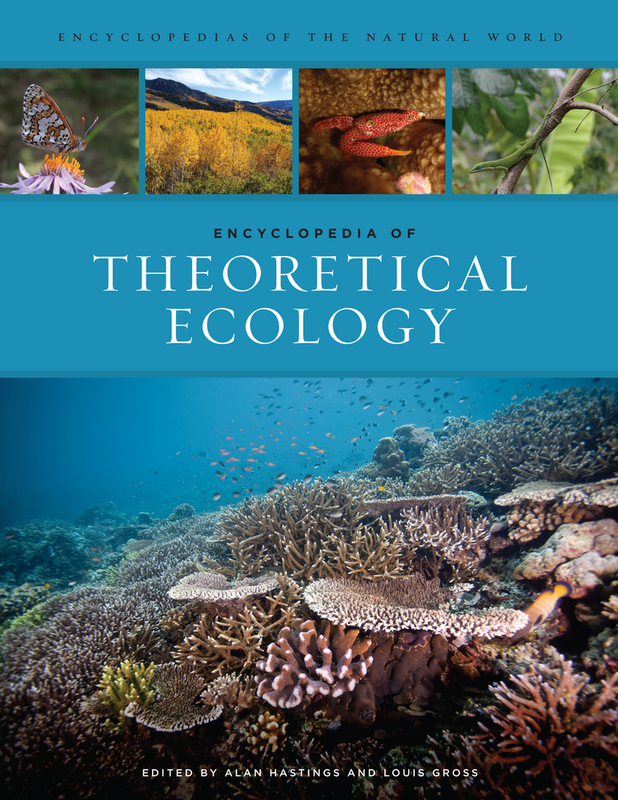 This major reference is an overview of the current state of theoretical ecology through a series of topical entries centered on both ecological and statistical themes. Coverage ranges across scales—from the physiological, to populations, landscapes, and ecosystems. 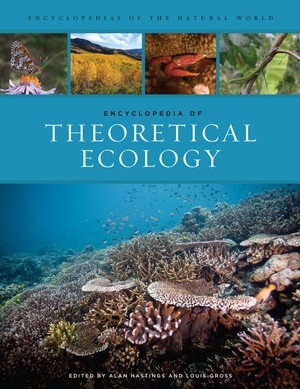 Entries provide an introduction to broad fields such as Applied Ecology, Behavioral Ecology, Computational Ecology, Ecosystem Ecology, Epidemiology and Epidemic Modeling, Population Ecology, Spatial Ecology and Statistics in Ecology. Others provide greater specificity and depth, including discussions on the Allee effect, ordinary differential equations, and ecosystem services. Descriptions of modern statistical and modeling approaches and how they contributed to advances in theoretical ecology are also included. Succinct, uncompromising, and authoritative—a “must have” for those interested in the use of theory in the ecological sciences. Alan Hastings is a Distinguished Professor at the University of California Davis in the Department of Environmental Science and Policy. He is the Editor-in-Chief for the Theoretical Ecology Series (Academic Press) and the Journal of Mathematical Biology. Louis Gross is a Professor of Ecology, Evolutionary Biology, and Mathematics, and Director of the Institute of Environmental Modeling at the University of Tennessee.